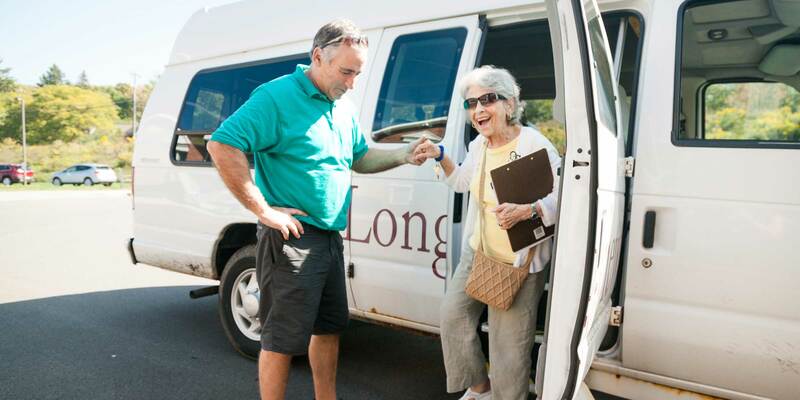 Transportation - Longview - An active retirement and assisted living community. Running errands is a lot more enjoyable when you’re sitting in the back seat. In addition to Longview’s shuttle providing transportation to and from Ithaca College, the Recreation Department takes residents on two shopping trips a week, as well as numerous visits to museums, parks, and other outings. We also have a personal shopper service available for residents needing just a few items. Public transportation is plentiful, with regular service from Tompkins County Area Transit (TCAT) buses, Gadabout– a local volunteer van service, and taxi cabs. Residents who still drive are welcome to bring their personal vehicles to Longview. Ample parking is provided. Resident vehicles must be registered with the Administration office and must display the proper parking decal. For more information, contact Administration.